Ibex Trex was founded back in 2005 by avid walkers Dan & Amy Shaffrey. We have always enjoyed walking and started to look for areas to open a walking business. 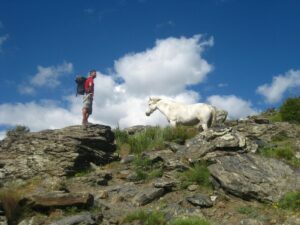 We chose the Sierra Nevada and Las Alpujarras as it is a vast beautiful area with great area and some fabulous walking. We moved to the Sierra Nevada in 2003 and started to work on our house in Narila to make it into accommodation for walkers on holidays. The house was ready for the autumn season in 2015 where we had a few groups but soon realised the bed and breakfast way was not for us. So after a rethink we started to use hotels in the Sierra Nevada in the 2006 season. From here we never looked back and now enjoy guiding and creating walking holidays all over Spain. As we are walkers ourselves we create holidays we would want to go on and we use our same formula of great walking, great accommodation, great holiday in all the areas we walk in.